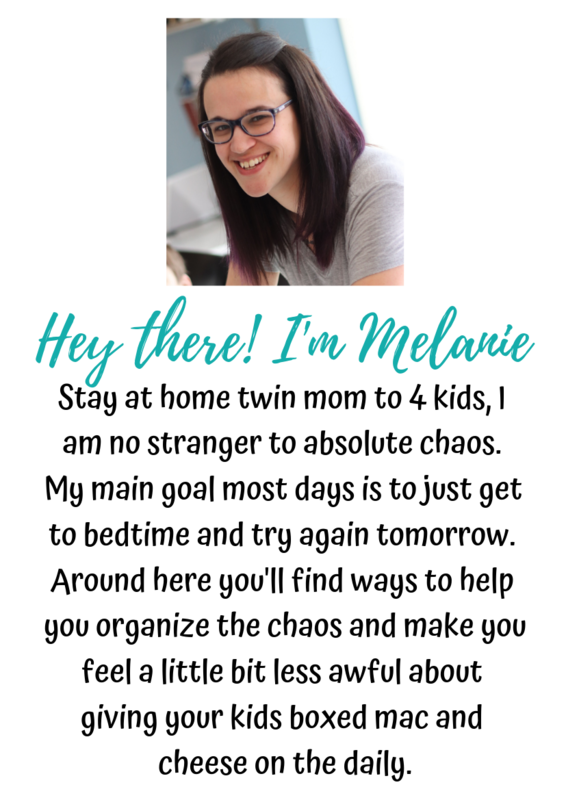 I reached out to the overwhelmed moms in my moms group and we put some stuff together to help. I asked them what makes them feel overwhelmed, what they need when they’re overwhelmed and what happens when they’re overwhelmed. Let’s chat about those things, shall we? What makes you an overwhelmed mom? Crying babies – Instant overwhelm. There is something about a screaming baby that makes the most simple task seem incredibly stressful. This could set anyone off! Sick kids: Your whole schedule is thrown off when you have one or more sick kids and this can irritate anyone! Kids are crabby, you’re stressed trying to get them to stay hydrated, etc. It’s an unfortunate situation for everyone involved. High expectations: This can be from your partner, your friends, your job, society. We, as women and mothers, feel like we need to do ALL THE THINGS with help from no one, and that’s just not feasible. Messes: Clutter was a big trigger for these moms. To be organized, you have to feel organized. Too much going on: Kid A needs to get to soccer, B has a school meeting and C has swimming lessons. All within 10 minutes of each other and all across town. WTF?! No help: Let’s be honest – sometimes we just don’t have the help. This makes us crazy. Whether it’s because we can’t ask or don’t ask or just don’t have anyone to ask. It’s hard. So, what do we need to battle this overwhelmed mom feeling? I’m so glad you asked, because we talked about that too. Prioritize: Write everything down. Feelings, tasks, to do’s, projects…everything that comes to mind. Then prioritize all them with real thought. What can wait and what can’t wait? What needs to be done now and what can be done later, tomorrow, next week, etc. Anything that can be done together? ASK FOR HELP: For the love all that is holy, ask for help. Sometimes don’t ask for help, TELL for help. Demand help. How am I here to help you? I wrote out my Happy Tunes playlist for you so you can start your own, because an overwhelmingly amount of moms in my group said that happy music helps them. 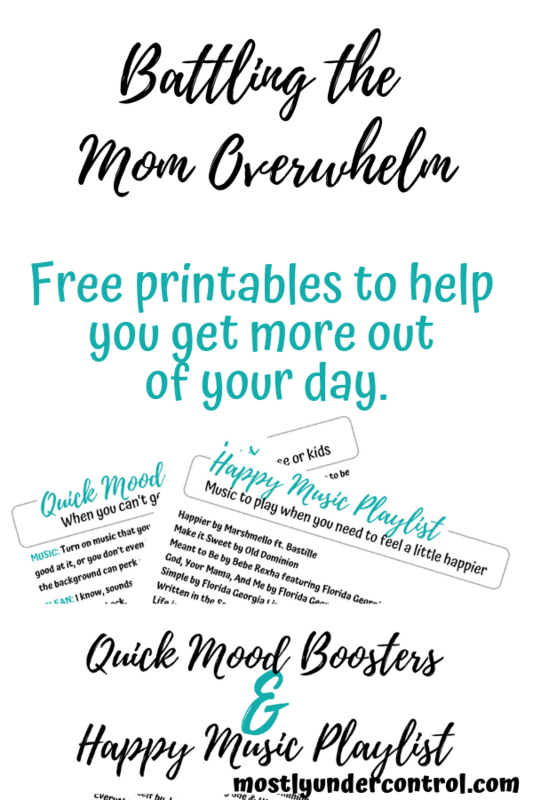 I also have a printable for you with quick mood boosters when getting away from the kids just isn’t possible. Grab it below! I also have an entire system waiting for you over at my Etsy shop. What can this system do for you? Help you brain dump and prioritize so you can feel less overwhelmed. Provides you with a quick reference guide of daily things that need to be done for success and some quick mood boosters that work for you when you need them. The ability to customize the system so it works for you and only you. Take control of your day and only clean/do things that you think are necessary for success. Not a list of chores to do every single day that someone else has written for you. 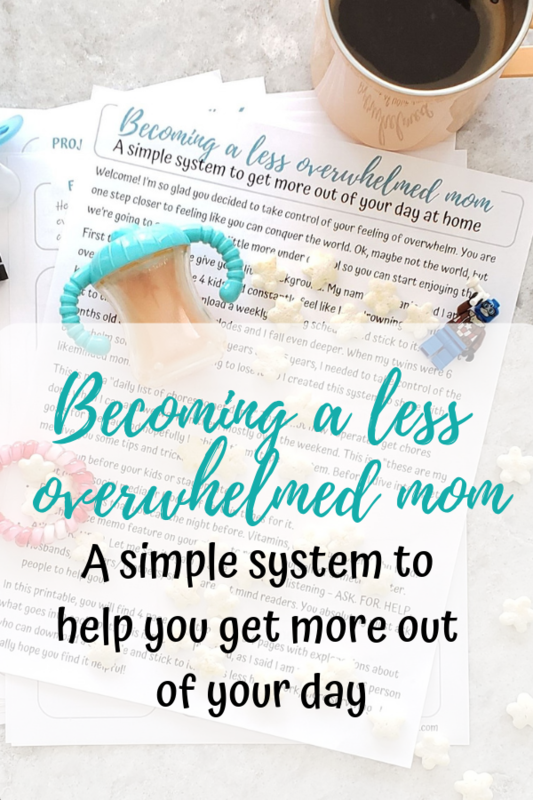 Want to help your mom friends through the overwhelm? 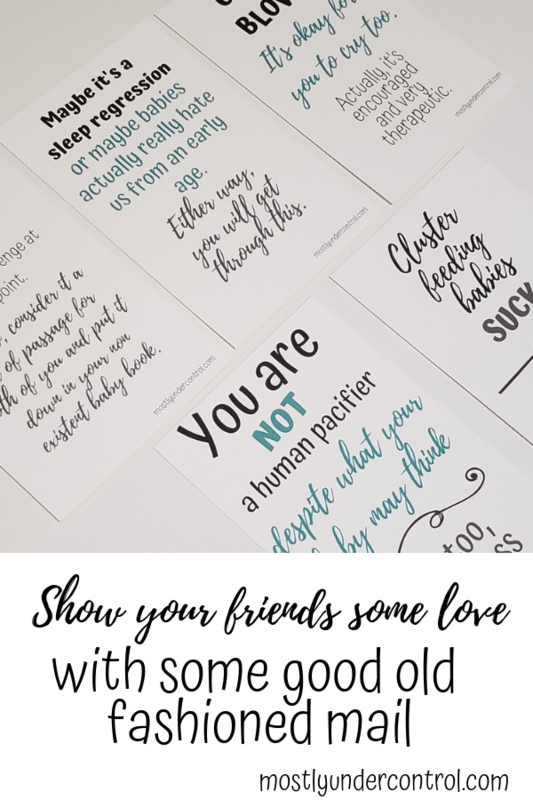 Check out these encouragement cards! Listen to the music and tag me on Instagram (@mostlyundercontrol) – let me know how you’re feeling!